So this was an interesting experience. 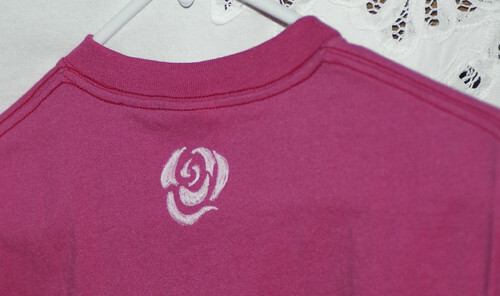 I had this great idea of using bleach pens on a tshirt to make some pretty white roses on a tshirt. 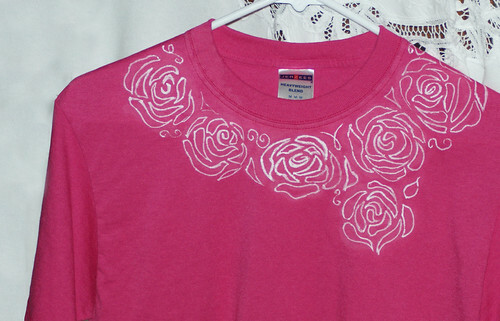 Had that worked, I probably would have covered the front of the tee in roses, but alas: the bleach pen did not work. I based the roses off a design we used on a backdrop for a show at college (when I say we, I mean the theatre department and my dear friend Jen, who ended up cutting out thousands of these roses herself). Simple and unique tshirt idea.